Masbedo’s work is undoubtedly antipodean to the widely used relation poetics based on minimal-gesture, ordinary behaviour and mimesis with reality. The young milanese duo (Nicolò Massazza and Jacopo Bedogni) is the in fieri revelation of the latest Italian art season. They opted for an acronym instead of using their own names not for the fusion and merging of two different personalities but to underline the establishment of a specific project and of a complex intervention which they personally conceive, control and direct from origins to completion. More than devoting to the usual ‘play in pairs’, Masbedo declares itself as a mark aiming for participation of people belonging to different intellectual spheres – a sort of call-up to join subjects and questions which not always pertain to art or specifically deal with it. It stimulates a diverse and intense taking of responsibility. Each of the used elements is explanatory to philosophical and ethical concepts through the privileged ways of the image. This is the main reason for which Masbedo is a visual arts-related project, when competences of arts weakens more and more. 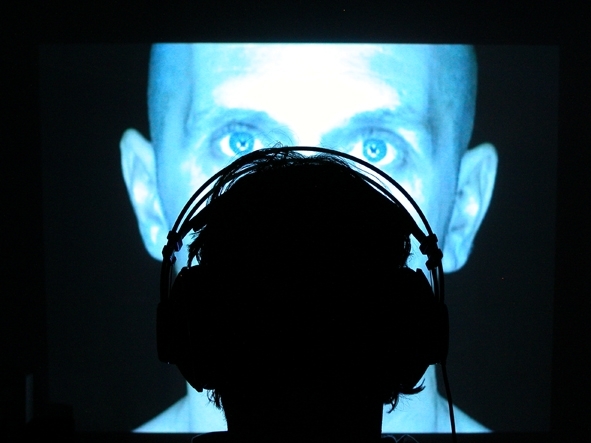 The work operates within complexity, using strict connections among media (photography, video, installations, sound, literary sources). The title of its new work, 11.22.03, which is the time needed to assist to the event, has a beginning, a narrative development and an ending. Thus, it is ‘crossed over’ by spectators who do not perceive it absently – just like Andy Warhol wanted them to; they are invited to place 11 minutes of their time and concentration at complete disposal of the show. Nothing is left to chance. The show is prepared in detail. Relevance is given to words that are given off without emphasis through the actors’ lips, without unnecessary movements of their facial muscles, sometimes whispered to themselves as a mnemonic exercise. Relevance is given to the play of the glances on opposing screens where images flow and merge one into the other. Relevance is given to the total lack of gestural expressiveness, clashing with the real essence of theatre and then crystallising into a larval condition in which the little grain of humanity that the two characters, a man and a woman, are trying to tell the public. 11.22.03 strongly acts on a symbolic level. 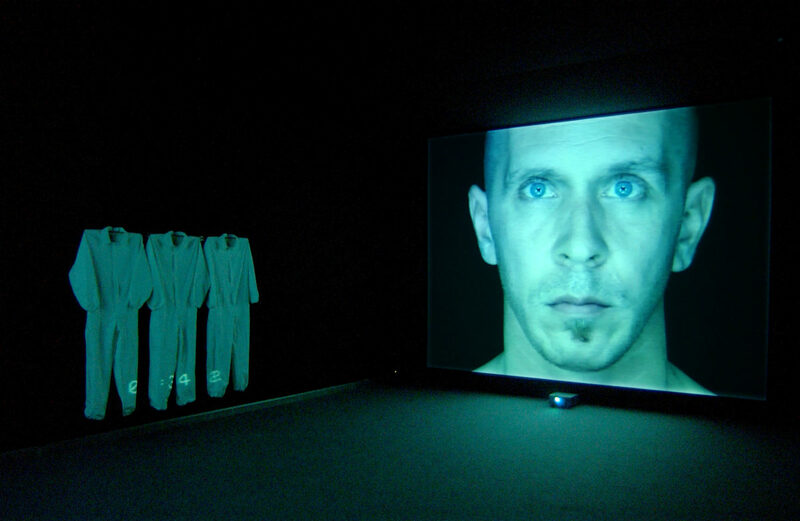 From the actors’ acting to the projection of images into space or on bodies (the overalls, designed by Masbedo and made under its instructions, can be worn or left swimming in mid-air), and from Michel Housellebecq’s played text (which was taken from Rester Vivant and adapted by the author himself together with the two artists) to Quite’s soundtrack (a group founded by Sergio Carnevale, former member of the Bluvertigo, playing experimental electronic rock), each element used fulfils a linguistic crossover which is never gratuitous nor accidental. Submerged in a wagnerian mystic gulf of darkness and under attack from uncommon senses and remaining mindful of the artaudian theory on Theatre of Cruelty, we do not “cross” the work’s space as agents-accomplices of an interacting process, but as being concerned in a moral and intellectual entreaty aiming at the deepest zones of body and mind. Masbedo’s strategy is far from the options of minimalism and in line with the contemporary trend of borrowing others’ bodies to reach an extreme and dramatic performance. No actors are asked to stand still for long periods, nor stamina is forced beyond any limit. No ineradicable marks are left, nor indelible traces are drawn. No torture nor humiliations are dictated by the power of Art. 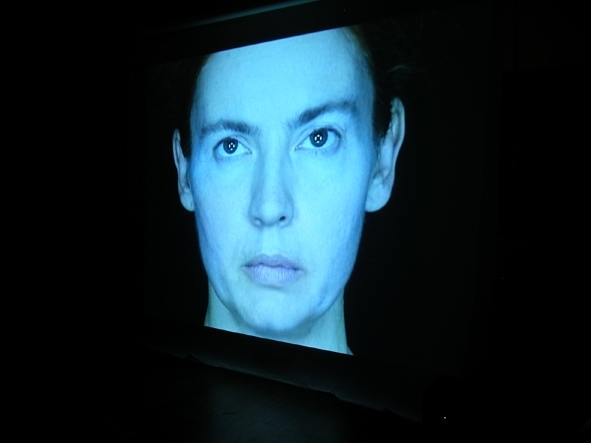 Masbedo asks for a loan of facial expressions for the dramatic strength of a glance. Or better still, it asks to tell things that are difficult to express and that nobody would hear, breaking the tension of the mise-en-scène, driven to the end of one’s tether, with a slow snowfall: the placid fall of the flakes smoothes the noises and dulls any roughness. An ironic applause closes it all, before stepping back to the black of the very beginning. After Il senso della lotta [The sense of fight], which dates back to the first months of 2002 and presented in more or less unorthodox expositive spaces, Masbedo carried on collaborating with Hoollenbecq, who precisely is the most difficult and controversial intellectual that better represents the crisis of the Western World in the epochal shift of our era. The new work went a step further into Masbedo’s self-awareness of being able to use such strong and connoted elements without losing sight of their own intentions, heading for a kind of art that wants to leave indispensable traces behind. 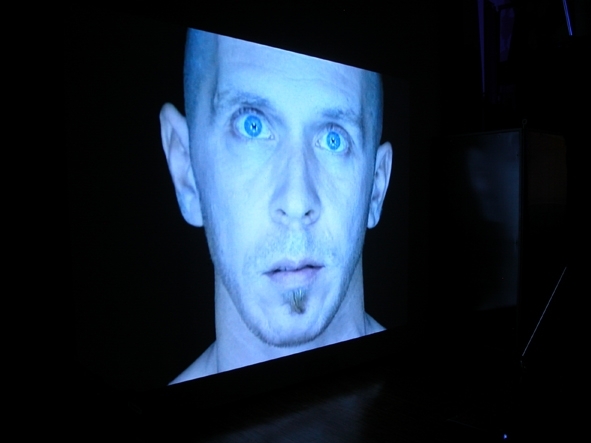 Of primary importance is the collaboration with Roman Terés, from ‘La Fura dels Baus’ and Patrizia Zappa Mulas, both protagonist in the European research and avant-garde theatre. In comparison with the poetics of the embezzlement pursued by Francesco Vezzoli, retrieving old and even dying icons, Masbedo escapes the chimera of narcissism and self-reflection, concentrating on the strength of the message that is magnified to the spectators’ eyes through the use of strong and connoted personalities. Video installations by Bill Viola and the dramatic structure of Matthew Barney’s works are fundamental points of reference of Masbedo’s aesthetics. 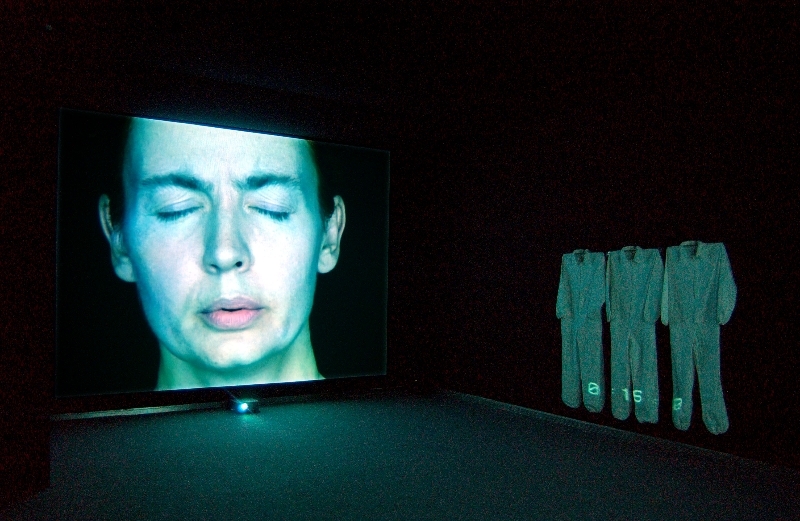 Even though Viola started from a minimalist and behavioural basis, he achieved extraordinary work of video-art based on the absolute effectiveness of the message, like in the marvellous Trittico di Nantes [Triptych of Nantes] (1992): the slow evolution of just three images can summarise the sense of the existence lying between life and death. On the contrary, since the 90’s, Barney embodies the staging of a spectacular event that originates as a project, becomes film and comes to an end as a fetishistic object. The use of guest stars is also fetishistic. Each person is chosen for their clear intensity. Whilst the American artist has a predilection for the strength of the mainstream, the young Masbedo shows affection for an outrageous and diverse territory, excluding consolatory attitudes and confronting us with the most dramatic contradictions of our time.